Flooding continues to prevent access to Modern Woodmen Park, forcing the Quad Cities River Bandits (Low A; Midwest League) to shift their April 15-17 home series to Cedar Rapids’ Perfect Game Field at Veteran’s Memorial Stadium.Modern Woodmen Park remains unaffected by the flood waters, but the continued operation of the Canadian Pacific trains make it impossible to access the ballpark safely without exposure to the surrounding flood water. Mississippi River flooding had been an issue for the former John O’Donnell Stadium for decades, but a renovation unveiled for the 2004 season introduced a flood wall system (later expanded in 2010) that kept the ballpark and its playing surface dry even during river crests. Also added to Modern Woodmen Park: a portable pedestrian bridge that extended to River Drive, allowing folks to cross a flooded parking lot to the ballpark. That bridge also goes over the Canadian Pacific Railroad line, but improvements to the rail line are keeping the trains running despite the flood waters. With the trains running, the bridge can’t be installed, and without the bridge, the team has had to adjust its home schedule. The opening series last week was shifted to Community Field, the home of the Burlington Bees, and the River Bandits’ April 15-17 home series is moving to the home ballpark of the Cedar Rapids Kernels. At this time, only the first three games of the six-game homestand have been moved. The City of Davenport has yet to determine whether the River Bandits’ home games scheduled for April 18-20 against Kane County at Modern Woodmen Park can be safely played. Each of the games at Veteran’s Memorial Stadium in Cedar Rapids will begin at 6:35 p.m. 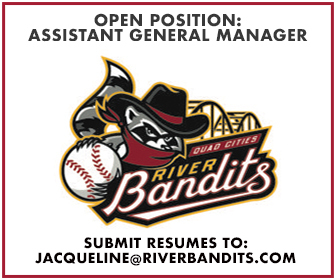 The River Bandits will serve as the home team for the entirety of the series. All tickets for the trio of games will cost $5. Tickets will be available for online purchase and at the gate in Cedar Rapids beginning on Wednesday, April 10.